Standing out among the yachts and fishing boats moored to a west-end Vancouver dock is a curiously shaped houseboat that looks like nothing so much as the front end of a Boeing 747. Inside, it is as warm and homey as a country cottage, stuffed with soft, mismatched couches, warm rugs, plants, exotic artifacts from Fiji and Haiti, and hundreds of thousand of dollars worth of computers, faxes, modems, televisions, video recorders, and other high-tech toys. This electronics-packed floating cottage is the home of 75-year-old Frank Ogden, a self-styled futurist better known as "Dr. Tomorrow". Perched on a comfy recliner with his keyboard in his lap, this aging cybernaut surfs the future, collecting global intelligence about emerging technologies via satellite television dish, shortwave radio, news wire, and the Internet. A news feed pumps data directly into one of his computers, ceaselessy spewing out information from around the world -- information that not only keeps Ogden up to date on the latest gee-whiz technological breakthroughs, but enables him to predict the direction the future will take. We live in a world where "expert" advice has become crucial to our well-being, without which we are unable to make the simplest decisions. In part it's a symptom of information overload -- there is simply too much raw information swirling through the datasphere for any single individual to absorb -- and in part it is the result of the misguided worship of technopoly and the acolytes who serve it. Expert guidance is now available on everything from finding a mate to getting a job, and few of us dare make a move without first hearing what the experts have to say. Ogden's pronouncements are treated as gospel by corporate CEOs and talk show hosts. Pulling in more than $450,000 a year from books, speaking engagements, newspaper columns, and radio shows, Ogden has turned the future into a thriving business. From Nairobi to Nagoya, Dr. Tomorrow is the globe's foremost practitioner of the art of future-telling -- and even at $7500 per speaking engagement, corporations and organizations are lining up to hear him speak. He is one of a growing number of self-proclaimed prophets whose words grow ever more potent in our future-shocked society. Carelessly repeated by impressionable journalists, academics, politicians, and advertisers, these words take on the force of fact, when really they are nothing more than propoganda and rhetoric. In fact, more often than not, what these people have to say about the future is either blatantly false or intellectually flawed. And yet, as Max Dublin writes in Futurehype: The Tyranny of Prophecy, "Predicting the future has become so integral to the fabric of modern consciousness, that few people feel compelled to question it." Wrapping itself in technological hyperbole and the worn out jargon of economics, futurism takes its cue from the pseudo sciences -- the so-called social sciences -- turning trend-watching into analysis and self-serving statistics into emprical proof. All this, in spite of the obviously banal conclusions of the sociologists whose statistics and experiments blithely confirm what common sense told us long ago, or the economists, whose "dismal science" is so woefully and consistently inaccurate that it is a wonder we give them any more respect than we do astrologers. Former US President Ronald Reagan is mocked for his reliance on astrology, but few criticize the voodoo economics he foisted on a hapless nation -- except other economists. As for the future, we're probably better off relying on the predictions of science fiction than on the futurists. Futurism is about trends, about extrapolation. It is about as reliable as Jeanne Dixon. We would do as well to read the entrails of goats as to try and understand the future by looking at the trends of today. In almost every case, futurism predicts a continuation of the thing that is happening. And that is not what the future is going to be. As Hannah Arendt so eloquently put it in On Violence, "only in a world where nothing of importance ever happens could the futurologist's dream come true. Predictions of the future are never anything but projections of present automatic processes, that is, of occurrences that are likely to come to pass if men do not act and if nothing unexpected happens." Over the past ten years a lot has happened that no futurist could have ever predicted -- most notably, the collapse of the Soviet Union. Shackled to the logic of superficial trends, few were able to discern the signs of decay and corruption eating away at the foundations of the Soviet empire. The most accurate prediction came not from the futurists, but from an obscure French political scientist named Helene Carrere d'Encausse, whose 1978 book, Decline of an Empire, laid bare the myth of a monolithic Soviet bloc, accurately identifying the factors that were already beginning to pull the Soviet Union apart. And who, for that matter, other than William Gibson, could have predicted the meteoric rise of the Internet? Even as recently as five years ago, the Internet remained an arcane realm inhabited by technophiles and academics, its applications limited to discussion groups and email. When set against McLuhan, today's futurists seem strangely devoid of inspiration. Cleaned up and sanitized for the masses, their proclamations echo McLuhan's famous aphorisms, their predictions reflect the technological boosterism of corporate annual reports, and their futures are nothing more than "a continuation of the thing that is happening". Now the Internet is here. And it's changed everything. Futurists, always quick to jump on the bandwagon, are now reworking their predictions to include the Internet. Not surprisingly, the "global communications revolution" has come to dominate their thinking. Marshall McLuhan, whose ideas were once ignored by nearly everyone but communication theorists and advertising copywriters, has now been resurrected as the patron saint of the Information Age. McLuhan, of course, never claimed to be a futurist. Which is probably why his ground-breaking analysis was so prescient. McLuhan's "global village" , his view that the information environment is an extension of our senses, his insistence that knowledge, not capital, is the new source of wealth, all make perfect sense today. But in 1964, at a time when television had yet to complete its conquest of our consciousness, McLuhan's radical analysis of the impact of communications media on social systems seemed incoherent and wildly cerebral -- certainly irrelevant to ordinary life. Even Alvin Toffler, whose influence has been profound and reaches deep into the corridors of power, continues to generate books on the future that are nothing but amplifications of the present. Just take a look at his first best-seller, Future Shock. Sure, he coined a new phrase, but what else did he tell us? The future of Future Shock was a strange world of hippie communes, open marriage, bizarre architecture and offbeat technology. In Power Shift, Toffler reiterated what any thoughtful person already knew -- we are in the midst of one of the most fundamental social transformations in history, one that ranks right up there with the Agricultural and Industrial Revolutions. But what did he tell us about the future? "The only constant is change," says Frank Ogden. "Learn to love it. The next big step is into chaos." True enough. But that's obvious to everyone except unionized workers in the steel and auto industries. On the other hand, Ogden's vagueness makes him less insidious than other fortune tellers. He makes no global claims, no broad predictions of who will dominate the next century. Instead, Ogden confines himself to serving up tasty morsels, technological tidbits that whet our appetite for change. His books read like Wired's "Fetish" column, crammed with breathless descriptions of the latest gadgets and accessories for the well-equipped traveler to the future. And Ogden loves his work. At an age when most people are fading slowly away in front of their television sets, this gnome-like septuagenarian is working harder than a man half his age. His boundless energy is reflected by the sparkle in his eyes, the spring in his step, and the exhuberance of his quavering voice. Unabashedly critical of the backwards thinking that paralyses big corporations, governments, and public education systems, Ogden is more social critic than trend-spotting futurist. His pronouncements make many who listen to him uncomfortable. "I've had more than two thousand people walk out on me, " he says proudly. "I've had seven coffee cups and a chair thrown at me. Three people even vomited." It's hard to believe that Ogden can elicit these kinds of reactions. Tiny, diminutive, and prone to the kind of mental wandering you would expect from a man his age, he hardly seems the kind of man capable of shocking or upsetting his audiences. After all, it is the present, not the future, that Ogden is really talking about. "If you are not aboard the steamroller of change," Ogden warns his corporate audiences, "you stand a good chance of being part of the road." Perhaps, on these occasions, Ogden has not been addressing the corporate surfers of the future, but the workers who are being downsized out of existence. Ogden betrays a callous insensitivity to the victims of change, and like many of his compatriots has few thoughts on how to ameliorate their pain -- other than the exhortation to "Be self-employed, not unemployed." "Jobs are going the way of child labour, slavery and indentured service," says Ogden, hardly encouraging news for the millions who have been trained their whole lives to believe that a good job and steady paycheck are the dividends of playing by the rules in modern society. "Jobs are going the way of child labour, slavery and indentured service,"
Ogden's lack of concern for the casualties of the future is not surprising, however. In many ways, Ogden epitomizes the self-made man. "I have no academic qualifications whatsoever," he boasts. "That's my biggest asset. Instead of a Ph.D., I have an LSD." An LSD? What is the old geezer on about, you wonder. Well, as it happens, Ogden is right up there with Timothy Leary and Aldous Huxley as an early disciple of the mind-expanding benefits of the psychedelic experience. In 1960, Ogden read a news story about a psychiatric hospital in Vancouver that was using LSD as a therapeutic drug. This sounded interesting so he took himself off to Vancouver and asked for a job. They asked him what his qualifications were. None. They asked him what his experience was. None. "I'll tell you what," Ogden told the baffled psychiatrist, "I'll work for free for one month and if you like me, you can hire me." He spent the next seven years at the hospital, working as a researcher and therapist. Ogden looks back on this period as perhaps the most important transitional period of his life. If anything explains his current outlook on life, it's LSD, he says. "LSD opened my mind. It allowed me to think in new ways, to see the world differently." And with that new outlook on life, Ogden's career soon took a turn. After spending a couple of years helping turn a bottom-feeding Montreal FM radio station into the city's Number One rock radio station, Ogden was invited by the Ontario College of Art to teach a course in Creative Thinking. Later on, he spent two years in Haiti studying the Voodoo culture and non-verbal communication. There he took part in a five-day "purification by fire" ritual. His hands and feet were thrust into the fire 12 times. "But I wasn't burnt. I can't explain it." 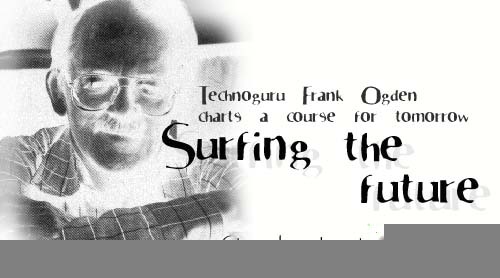 With his soul strengthened by fire and his mind opened by LSD, Frank was ready to embark on the next stage of his life. In 1976, he built the houseboat in which he still lives today, filled it with state-of-art technology, and began peering into the emerging data waves of the future. Today, like many other former devotees of LSD and other psychotropic substances, Ogden is an ardent believer in the mind-expanding capabilities of technology. "The ones who succeed in the future," he says, "are those who learn to walk on electrons and dance with electrons." Since then, Frank's never had to worry about what to do next. With the pace of technological change constantly accelerating, there's always something new for him to study and write about. Today, he shows no signs of slowing down. His latest book, "Navigating in Cyberspace" comes complete with CD-ROM and is a best-seller in both Canada and the United States. He makes appearances on everything from the Discovery Channel to MuchMusic. And he's always on the go, logging in more than 300,000 miles a year as he jets around the globe in search of the next big thing -- which, by the way, is biotechnology. "Imagine," he says, "In ten years your cousin could be a giraffe." Like a kid in a candy store, Ogden revels in the ceaseless flow of new technological gadgetry. The first thing he gives you when you meet him is a plastic laminated business card which features an MRI scan of his brain -- which, if the latest psychological studies are anything to go by, may reveal much more about his personality than he might like. Next, he'll tell you about the artificial lens in his eye which, as he says, makes him a cyborg -- a fact he is very proud of. And let's not forget the special ink encoded with his DNA , the paintings on the walls that double as heat reflectors, or the solarium powered by waste heat from his refrigerator. You gotta love the guy. His childlike enthusiasm and eagerness to impress would make even the most rabid technophile blush. And when you get down to it, Dr. Tomorrow isn't really a futurist or a prophet, he's just an old guy living on the edge and loving it, dreaming up new possibilities in a world of possibilities. Circuit Traces would love to hear what you think about this or any other story. Please send your comments to the editor. Copyright Circuit Traces Communications © 1995-1996, All rights reserved.